Despite efforts by the Department of Education to educate prospective college students about the burden of student loans, nearly two-thirds of students who took out loans to pay for college say they had no idea what they were signing up for. To fix this problem, it’s going to take more than making these students sit in a class about financial aid and student loans; it may require an overhaul of the entire college financing system. Sure, the DOE and most colleges offer courses or, at the very least, online resources to inform students about the long-term obligations associated with taking out student loans, but those efforts likely aren’t enough. According to the results of a recent survey [PDF] from our colleagues at Consumer Reports, most students with loans felt the information they received through financial aid information sessions prior to enrolling in college wasn’t helpful. Of the students who took part in at least one financial aid counseling session, most reported that the financial aid officers they met with were not prepared for, or tasked with, helping students understand the reality and consequences of taking on student loan debt. For example, 27% of respondents said the information they received about debt management and consolidation assistance was not useful at all. These feelings are likely the result of what some advocates feel is a largely automated financial aid information system. It’s generally up to each school to tell affected students how to complete this entrance counseling, according to the DOE. Colleges may, for example, require in-person counseling, or they may allow students to complete the counseling online through the school’s own financial aid office, or the DOE’s student aid office. That means there’s no way to objectively measure or monitor what students are getting out of this counseling. “There are only bare bones requirements under federal law, and in practice students appear to get varying levels of counseling depending on which schools they happen to attend,” Suzanne Martindale, staff attorney for Consumers Union, tells Consumerist. So how can the DOE, colleges, and advocates ensure that students are getting needed information to handle their financial situations before, during, and after graduation? Overhaul the system by creating clear, concise notification for borrowers. This counseling would entail clear, standardized information with plain-language terms, similar to the DOE’s Financial Aid Shopping Sheet. That resource, created by the DOE and the Consumer Financial Protection Bureau, and first made available for the 2013-2014 financial aid award year, has already been adopted by thousands of schools. 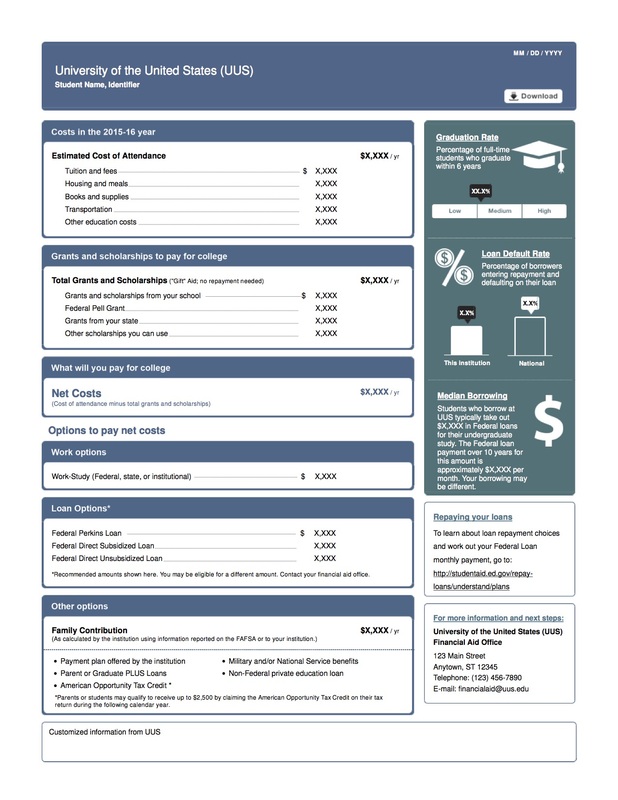 The Shopping Sheet was created to be a consumer tool that participating institutions could use to notify students about their financial aid package. It’s designed to simplify the information that prospective students receive about costs and financial aid so that they can easily compare institutions and make informed decisions about where to attend school. Martindale suggests that additional resources could include statistics of graduate outcomes. This would provide prospective students with information — based on their area of study — that may help them determine if taking out a loan for a certain major will be financially viable in the future.